The extra risks associated with roof anchors on single-storey buildings has again been highlighted in the newly revised workplace falls model code of practice. Safe Work Australia published a revision of the model Code of Practice, Managing the Risk of Falls at Workplaces (“Code”) in March. A worker wearing a harness attaches it to a shock absorber and lanyard system. During a fall, the shock absorber deploys and extends. This extended distance is added to the person’s height, lanyard length and a safety factor, which allows for harness stretch. Under the revised code, a person who falls can be expected to travel 6.5 metres before their fall is arrested. Effectively, that eliminates single-storey buildings and typical warehouses. Those around 6 to 8 metres high do not provide enough fall clearance if there are obstacles below like trucks or canopies. Using a technique of restraint, it is possible to use a harness-based system on a roof that is less than 6.5 metres from the ground safely but equally as easy to get it horribly wrong. 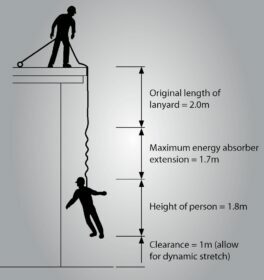 Simply use the incorrect length lanyard on an anchor close to gutters, for example, and a system design intended to prevent any risk of fall can unravel in an instant – with fatal consequences. In fact, the Code points out that harness-based systems should only be used if it is not practicable to provide a barrier such as a guardrail. In many cases, guardrail is the most practicable and commercial solution. Consider the lifetime costing of equipment and all of the administrative, inspection, maintenance and training requirements for anchor and static line based systems. Also known as toxic shock and suspension trauma, the risk of death is real, Dr Bill Wheems and Dr Phillip Bishop of the University of Alabama explain in “Will Your Safety Harness Kill You? Using higher-order controls like platforms, catwalks and guardrailing satisfies the legally powerful hierarchy of controls. Importantly, such passive height safety equipment reaps cost savings with lower lifetime costs, reduced administration and ready access for maintenance without the need for specialized height safety skills. Australian Standards AS/NZS 1891 (anchors and static lines) and AS 1657 (Ladders, platforms, walkways, guardrailing) are referenced in the code. Deviating from them would need to be justified if an incident was examined in court. Document reasons for any deviation in a risk assessment, reviewing the likelihood and consequence of a fall, comparing the cost of safe and compliant control measures versus the cost of injury. Standards are undated in codes of practice, ensuring that revisions to standards are always referenced. This is particularly relevant to AS 1657, which was revised in 2013 and AS/NZS 5532 (Anchors), which was published as an addition to AS/NZS 1891 dealing with testing of anchorage points. Together, they spell out sensible height safety rules that make it clear how workplaces can increase the safety of workers at the lowest possible cost while minimising legal liability. It’s essential reading for any workplace with a roof that needs maintenance, especially if it’s less than 6.5 metres off the ground.